Global Arts Corps is an international group of professional artists who use the transformative power of theatre to bring together people from opposite sides of violent conflict, unrest and war. Their productions draw together performers and audiences from different parts of countries’ cultural, religious and racial divides to create dialogue and a space for people to hear the stories of people they have learnt to hate, distain or fear. Their productions from South Africa and Cambodia have toured in 17 countries and reached over 90,000 audience members and 12,000 through reconciliation workshops. 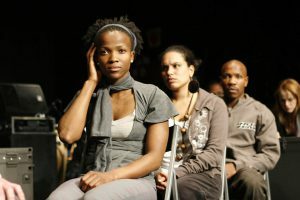 It was started in 2005 when the American theatre directors Micheal and Jackie Lessac travelled to South Africa to develop theatre and film projects with South African artists that explored their struggles for justice and celebrated the possibility for change. The South African production, Truth in Translation, told the story of the South African Truth and Reconciliation Commission through the eyes of the Commission’s young interpreters. Over two and a half years, Truth in Translation toured to 24 post-conflict areas around the world, posing the question Nelson Mandela asked of his country, “Can we forgive the past to survive the future?” Subsequent productions include Hold Your Tongue, Hold Your Dead which brought together republican and loyalist actors in Northern Ireland and See You Yesterday which worked with 2nd generation genocide survivors in Cambodia, young circus performers who wanted to to explode the traumatic legacy of silence in their country. 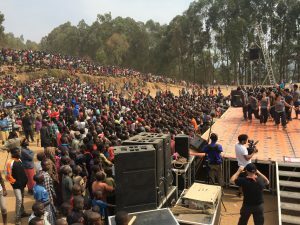 The cast of See You Yesterday travelled to Kigeme refugee camp, Southern Rwanda, and played to audiences of over 5000 Congolese refugees. Documentaries films of the plays and their tours provide additional insight into the complex and challenging processes the performers go through and have been screened at film festivals and events worldwide. Global Arts Corps’ work is grounded in the partnerships they build with artists,local NGOs leaders, educators and young activists in their production’s home countries and the locations to which they tour. They have created a team and a network of associate artists and aim to grow and sustain an international community of artists, a ‘go-to resource’ for collaboration with peoples emerging out of violent conflict. They strive to ensure that their audiences extend beyond the normal theatre going public and by creating films of the development of each production they extend their audience further. Global Arts Corps describes the stage as a ‘laboratory for conflict preservation and reconciliation’. Acknowledging that conflicts are ongoing even when peace has been declared and that hatreds need to be understood in order to prevent recurring cycles of violence, they advocate theatre as a tool because of the centrality of listening to an actors’ craft.